MERIDA — At the end of the first quarter of 2017, the Yucatan tourism industry had amazing results, not only because it exceeded the 2016 tourists influx, but because there are many positive factors such as the construction of hotels, greater global promotion through Samsung, new international flights and the visit of United States travel agents who move millions of Chinese tourists each year. 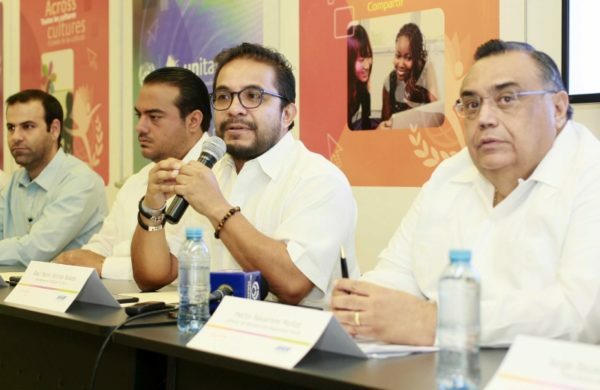 Tourism Secretary Saúl Ancona Salazar anticipated that in the next 36 months there will be pleasant surprises in tourism because all the indicators in this sector register “sensational” growth. On June 27 or 28, the Yucatán Tourism Observatory project will be presented by academicians, who will analyze the data of this industry, guide and propose improvement actions to bring more visitors to the State. Hotels in Merida recorded the highest occupancy during the period from January to April 2017 with 67.1%, which represents an increase of 8.9 percentage points compared to the quarter last year. The other hotels in Yucatan together had 61.3%, which is also a number that surpasses all previous ones since 2013. Since 2013 the influx of overnight tourists has increased both in Merida and Yucatan. In the capital of the state, the overnight stay was 53% in the first quarter of 2013; 56.4% in 2014; 60.2% in 2015; 61.3% in 2016 and this year made a tremendous leap to 67.1%. Another indicator of the intense dynamism of tourism in Yucatan is reflected in the numbers of rooms available and occupied in the hotel industry. In the first quarter of 2016 there were 934,695 rooms available and this year 962,196, a growth of 17%. In occupied rooms of the same period, in 2016 there were 531,098 and now it is 589,753, nothing more and nothing less than an increase of 44.6%. In order not to lose this rhythm of sensational growth, as described by the head of Sefotur, the sector looks for strategies to maintain these levels in May and June that are considered as low seasons for tourism. However, noted Saul Ancona, at this point Yucatan has the conditions to have high expectations on this summer vacation season. The impact of the signing of the agreement between the government of Yucatan and the Samsung company for the promotion of the new International Congress Center is still not perceived, but according to Secretary Ancona Salazar, it will surely be a great source of tourists for the state, because its internal and external communication channel is immense throughout the world. Commercial advertising value it would be contributing to the State amounts to the equivalent of more than $100 million, when the resort tax is $39 million and is the money that goes to the hard advertising of the destination Merida and Yucatan. In two months officials will officially sign the commercial alliance between the government and Samsung. The statistics for the first four months of 2017, were all positive, thanks to the collaboration with the private sector. And that coincided the president of the Chamber of Commerce of Merida, Juan José Abraham Dáguer, who remarked that the tourist movement is noticeable in trade shows, medical tourism, and university, so no doubt tourism has a promising future with the millionaire investments in commercial plazas, in the developments Cabo Norte, Vía Montejo, extension of Galerias Mérida that are all indicators that the state economy is great.